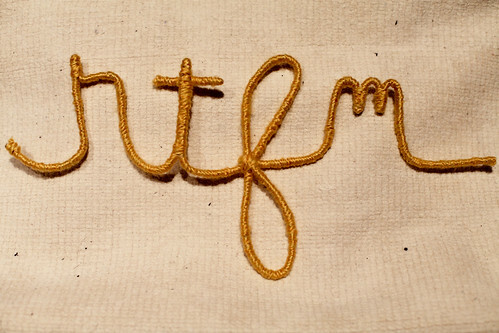 Quick crafting project: yarn words (and acronyms). Found this at Craft, but here are the full instructions. I couldn’t find any wire reinforced clothesline, so experimented with thermostat wire and others: basically, check out the wire section of your local hardware store and test what they’ve got. You’re looking for something bendable, but that will retain its shape, and can definitely be doubled up on itself, hopefully flush, without a little loop at the end. Some wire types I found did this better than others. Also, you’ll want to use chunky, bulky or worsted weight yarn, or else you’ll be winding for a very long time. I’ve made three, and they’re pretty quick once you get going, other than having to remember how to do cursive and remembering that i’s and j’s have the problem of not easily being able to do dots with this format. “Weird” was my first, then “rtfm” and “pebkac.” Other geeky words and acronyms may follow. Monday is part 2 of our Knitting Workshop series. We will continue to work on our scarves, and any individuals who want are welcome to try their hand at spinning yarn. Because of the amount of equipment that needs to be moved into the space for this demo, we will start this session a little late. Expect it to begin around 7:15-7:30pm, but feel free to arrive earlier. All are welcome to attend, even if you missed the first session. PS:One will be hosting a series of free Knitting Workshops beginning on Monday, December 6th at 7PM and continuing every other Monday. 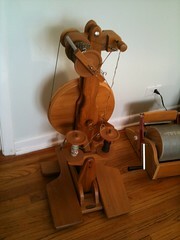 In addition to learning to knit, you will get demos of dyeing and prepping fiber, spinning yarn, knitting machines, etc. You can join these workshops at any time as a beginner, but if you miss the first session, please try to come in a little early so that we can spend one-on-one time with you to get you started. Knitters with experience are more than welcome to join the group, sit in for workshops, and help beginners with their dropped stitches! Every knitter I know has started by knitting a scarf, so that is what I will be teaching you all to do! 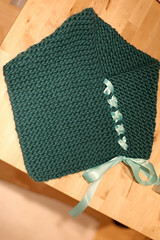 The first session will be dedicated to showing you how to cast on and knit your first few rows of the scarf. Materials: While the workshops are free, you still need to bring some yarn and needles. Find a craft store and look for yarn that you like in “worsted weight,” “chunky,” or “bulky” sizes. 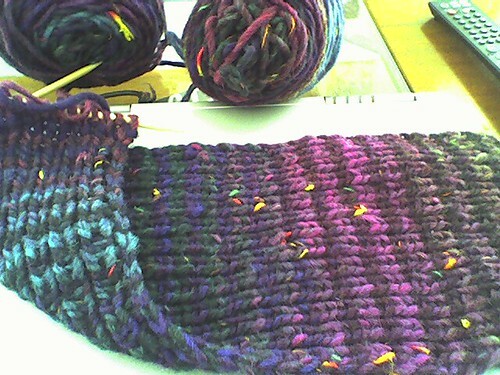 To do this, look on the side of the yarn ball at the chart showing gauges. You want something that ranges from 20 stitches per 4 inches to 14 stitches per 4 inches. The gauge will list a needle size next to it, so pick up a pair of straight needles in the size it lists. Most craft stores have knitters on staff, so don’t be afraid to ask for help in picking materials. I will have a few sets of materials available for drop-ins, but you might not like the colors or types of yarn I give you, so please be sure to pick up your own! If these workshops go well, we will do a group project for the space after we finish making our scarves.